Robot Bachelor is the latest in a series of unfortunately named pop punk bands fronted by Grath Madden (House Boat, The Steinways, at least three other bands you’ve never heard of). This time Luke McNeill (The Copyrights, Hospital Job, Starter Jackets) plays drums, Noelle Stolp (Rational Anthem) plays bass, and everybody sings. But don’t worry, it still sounds like all the other ones. 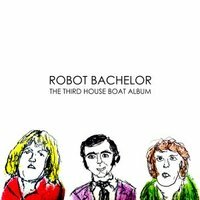 The Third House Boat Album is a pop punk record of appropriate length featuring an appropriate number of songs. It was recorded over an appropriate number of days in August, 2016 by Luke McNeill in his luxurious basement in scenic Springfield, IL. Additional vocals were recorded a few weeks later in Jon Vafiadis’ plush Forest Hills, NY apartment by, appropriately, Jon Vafiadis. Remaining bits and pieces were recorded by Grath Madden in his dilapidated hobo den in Astoria, NY. The record was mixed and mastered by Luke, although I wasn’t there, so I have no way of proving that.